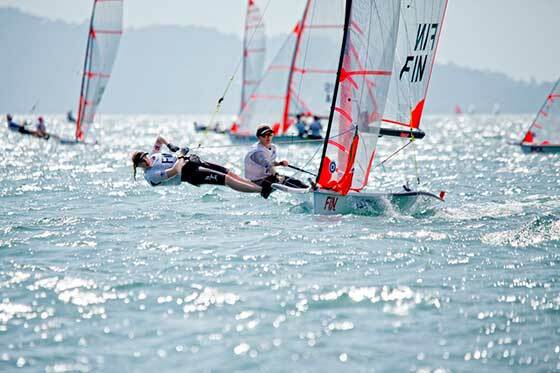 Day two of the 45th Youth Sailing World Championships saw some perfect sailing for a chosen few as the big breeze was back in Langkawi, Malaysia. The record numbers of 425 sailors from 76 nations had winds to mimic day one with 20 knots blowing which eased off later in the day which again tested the young sailors with tricky shifts. With the discard now coming in to play, there were changes in the rankings and those that put the hammer down to move up in the overalls. There were some that handled it perfectly and just couldn't lose on day two. The girl's 420 was the first of the perfect days. Austria's Angelika Kohlendorfer and Viktoria Puxkandl took two bullets to make up for the 'middle of the road' first day. With the discard now in play the duo can count their bullets along with a 13th place whilst discarding a 17th from the first race of the regatta. It pushes them to fifth in the rankings, but they know they haven't got the room for manoveure that their rivals have. One of those rivals is Australia's Nia Jerwood and Lisa Smith. Just behind in both races with two second places, the pair top the leaderboard on five points. So what did Jerwood think of the day? "We had a really good one. The wind picked up towards the end which we like to get in to our speed groove. We got two seconds, but the Austrians were planing too fast on the upwinds and got by us both races, but it was a good day for us." It was a good day as they maintained their high finishes, and with the weather forecast looking similar all week, Smith was certainly happy for what is to come, "We definitely like the windier weather. It's what we prefer and its good because we weren't expecting it here in Langkawi. Its definitely kicked up for us and it's more like home when it's like this so we are more comfortable in this and we know we can go fast." While both the Austrian's and Australian's were in their groove today, Poland's Julia Szmit and Hanna Dzik didn't have quite the same luck. They still sit in second overall on nine points after a fourth and a discarded 13th but from hereon in they will be looking to get back to the standard they set on day one after posting two top three finishes. Creeping up on the Polish pair and rounding out the top three are USA's Christine Klinger and Victoria Thompson who have 10 points after a discarded seventh and third today. 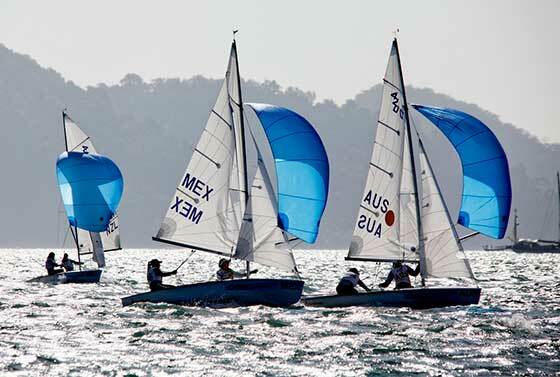 The first bullet of the day went to Ireland's Douglas Elmes and Colin O'Sullivan who sit in third on 14 points with last year's Youth Worlds gold medallist Singapore's Jia Yi Loh, now sailing with Matthew Lau, in fourth. Loh and Lau had an average day by gold medal standards with a discarded 12th and a sixth place. 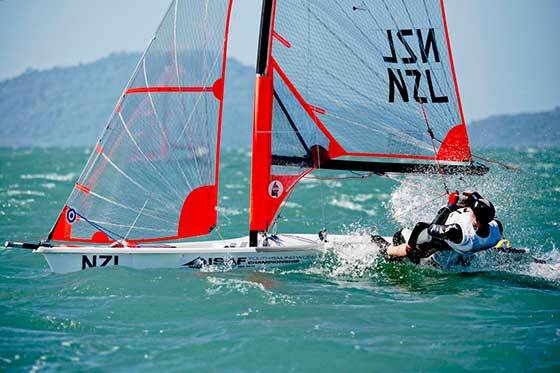 The perfect day continued in the boy's 29er as New Zealand's Jackson Keon and Nick Egnot Johnson took three bullets. 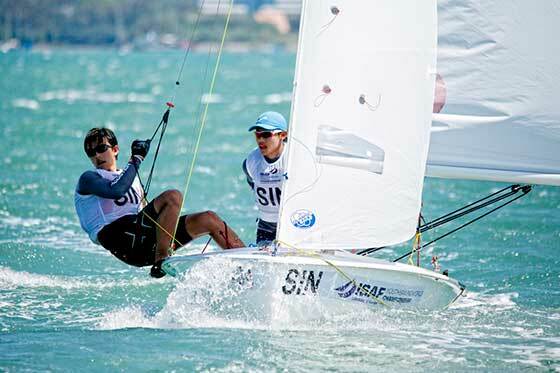 Reminiscent of their compatriots and current Rolex World Sailor of the Year winners, Peter Burling and Blair Tuke, they dominated the day in their class. But is it right to make that comparison, Nick doesn't think so as he says with a wry smile, "Not really. Those guys have won every single regatta. We wish we could do that. But those guys are role models for sure." So back to the days racing. The duo must have felt something was clicking today. Surely they would be happy with the results, but with a calm demeanour helm Jackson simply said, "We had a good consistent day. The breeze was up and it helped us a bit to get some bullets. We would be happy with anything but we seem to be doing well in the strong breeze so we can't complain." Three bullets can be considered some pretty consistent racing, and Jackson knows that consistency is the key going forward, "We need to just keep chipping away at it and making sure we get top fives in each race and not doing anything too stupid. Today was definitely a confidence boost for us but every day is different so we have to hope for some consistent racing." With the New Zealanders in second overall on 15 points, they lay just behind Norway's Tomas and Mads Mathison. On 12 points, the brothers have been quite consistent themselves. On day one they were top three in all of the races. Moving on to day two, they had their lowest finish of the regatta with a fourth which they can discard. If consistency is the key for this one, then Norway are certainly leading that category. With a 5-6-3 for the day, Slovenia's Peter Lin Janezic and Anze Podlagar sit in third on the leaderboard with 20 points. It may have been an up and down day for Finland's Sirre Kronlof and Veera Hokka in the 29er girl's, but they still hold first in the rankings. It seemed to be a rollercoaster ride all day for the girls. They started the first race well, but couldn't capitalise on it with a seventh place. They followed it with a bullet in the second and then slipped back to fourth in a much closer third race. Much like the team that they are, Sirre began explaining their day, "We didn't have a good start…", Veera took over, "Well we did have a good first start, but we took the wrong shifts so we weren't doing to well at the first mark." Back to Sirre, "The second race was great though. We won that with a good lead so it was nice. The third race we came fourth but it was super close. All four boats came in within about 30 seconds of each other so it was tight." The 29er boy's talked about consistency, but Sirre and Veera couldn't quite manage it today as Sirre reflected, "Obviously we would like pretty stable results, like top three all the time. Not so much up and down. But that's just the competition we have here. We try and do our best and with only one drop you have to try for stable results." For now they lead, but closing in are New Zealand's Greta and Kate Stewart who did what the Finnish girl's couldn't with a stable bullet and two second place finishes. Those results leaves them in second place overall on 15 points, just three behind the leaders. Not to be outdone by the New Zealand siblings, Spain's very own sisters took the other bullet of the day. Carla and Marta Munte Carrasco took the final race of the day, which made up for a DNF in the previous race. Those results coupled with a sixth place finish mean that they stand on 22 points and fifth overall. Poland's Aleksandra Melzacka and Maja Micinska are in third on 18 points with a fourth, fifth and discarded ninth on day two. Anything Austria and New Zealand can do, Australia can do as well as. Alistair Young (AUS) is the third person of the day to save all the bullets for himself. A two from two today, added to another bullet picked up in race one means he can discard a fourth place finish and sit top of the class on three points. His nearest rival is USA's Nicholas Baird who can only seem to finish in either third or fifth. With 11 points the American needs to break out of the trend and aim to knock Young off the bullet train. Finland's Oskari Muhonen and New Zealand's George Gautrey are level on 12 points with very similar days. Finishing in the top three, both teams discard results in the teens for the last race of the day. In the girl's Laser Radial, Poland's Magdalena Kwasna took a bullet and a third place to discard her fifth place from day one and sit in first overall on five points. The ever calm Maria Erdi discarded a sixth place finish and moved up to second place with a bullet in the final race of the day. The Hungarian shares nine points with Germany's Hannah Anderssohn who posted a second and third. Russia's Stefania Elfutina began the day with a fourth place in the girl's RS:X. Not content with that result, she took a bullet and second place that enables her to discard that fourth and lead the class on eight points. Again just behind and nipping at the Russian's heels is China's Xian Ting Huang. With two second places and a third, the consistent high places means she sits second overall on ten points. With an alternating trend of fourths and firsts (4-1-4-1-4-1), Great Britain's Emma Wilson is in third on 11 points. The Briton will be hoping for more bullets than fourths to move up into the medal places.Joint on points, France's Titquan Le Bosq and Argentina's Francisco Saubidet Birkner have 12 apiece with the Frenchman taking a bullet in the second race. Brazil's Brenno Francioli took the second win of the day. He also had a sixth, a fifth and he sits in fourth (overall) with 20 points. Third bullet and third place overall goes to Aruba's Mack van Den Eerenbeemt. The SL16 were out on the water today after the final pieces of equipment arrived following a shipping delay. With a fantastic job by the sailors who helped to complete the set up, they were out on the water by the afternoon. Racing continues at 10:00 local time on 31 December.